With Cinco de Mayo just days away, it feels appropriate to talk about a place aptly named Viva Cinco de Mayo. Tacos might first come to mind when thinking about this anglicized holiday that gives we Americans a chance to sip tequila and feel less guilty about the upcharge to add guacamole to our burritos. But consider instead the sope, a cousin to the taco, consumed using flatware and heaped high with filling. It takes on regional flavors, like the taco, and has different preparations depending on when and where it is eaten. 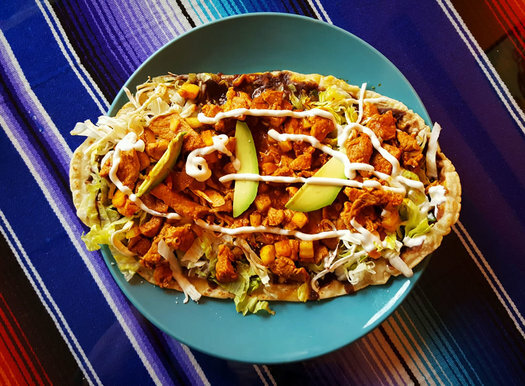 Nevertheless, it is just as crave-able as a taco, and this new addition to the growing Mexican food scene serves sopes up right. Don't confuse sope with sopa -- the latter is soup. One letter makes all the difference in the ordering, just like a tweak in preparation changes a taco to a sope. 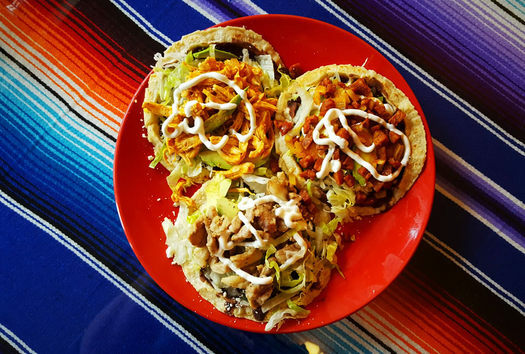 Sopes are made with a masa harina (cornmeal derived from hominy) tortillas, thicker than a soft taco shell, but thinner than the cornmeal that encases a tamale. Its pinched sides create a shallow basin for black beans pureed into a well-bodied sauce, brightly salted and rich with the flavors of cumin. Lettuce and tomatoes -- the classic elements of the "boxed tacos" of my youth -- nestle alongside avocado slices and crumbled queso. All sope orders at Viva Cinco de Mayo start the same, customized by the meat selections chosen by the customer. Three to an order ($9), the sopes come with the standard meat selections one would expect: Carnitas, seasoned steak, chicken mixed with chipotles in adobo. Al pastor (citrus-spiked pork), pollo (grilled or baked chicken), and chorizo (spicy sausage) are also available. The meat in all is long-cooked and tender, shredded before being served and easily cut with the pressure for a fork's side tines. The earthy beans, the chewy tortilla, simmered meat, and fresh vegetables are punctuated by a contrasting swirl of sour cream. A squeeze of lime keeps it all from being too heavy. Huaraches -- an elongated version of a sope for $9 -- are also available at Viva Cinco de Mayo with similar topping options (pico de gallo comes in lieu of diced tomatoes). Complimentary tortilla chips and salsa (your choice of green chile salsa or pico de gallo) are served upon seating, and that extra bit of flavor dolloped on each sopa is a welcome addition. 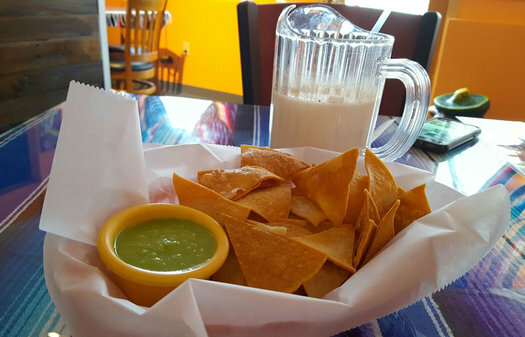 Budget an extra $2.50 for a small pitcher of horchata, sweet and toasty without the cloying feel of Mexican sodas. The loss of Bread and Honey, which formerly occupied the Viva Cinco de Mayo space, was mourned by the Pine Hills residents who frequented the shop for crusty breads, just-made bagels, and coffee to accompany the people-watching through the front windows. The long vacancy in the building made the loss even more prevalent. 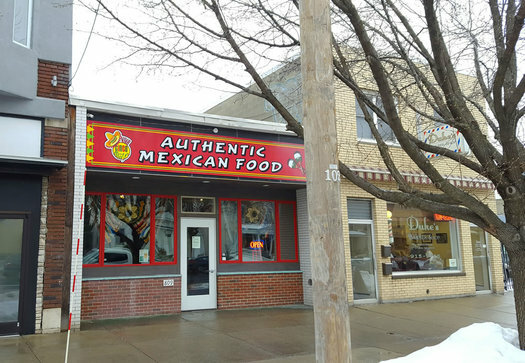 But the addition of a new Mexican restaurant in a residential college neighborhood signifies Albany's growing acceptance of "ethnic" cuisine in areas around the city. The service is quick, the location is convenient, and the clientele is diverse, speaking as much to a desire for good food as an openness to new residents. Thanks for teaching me about sopes (and a new place to try in Albany). However, you did confuse "sope" with "sopa" in the second paragraph. Editors: Thanks for catching that. Fixed. @Danny C -- I hope you check it out! My companion on the trip is a California boy who attests that it was as good as you'd find in SoCal. And wah about B&H! I loved that place. I have visited this restaurant several times and loved every bite! We also recently bulk ordered tamales for a party that were freshly made and super delicious. Service is excellent - the staff are friendly, knowledgeable and patient with my friends who have joined in with an odd request or two. Tried it the other day. Very nice small place. Service was fairly slow and the server seemed maybe... new at the job? Food was so-so. I'd love little places like this to succeed but I'm not optimistic based on what I saw.